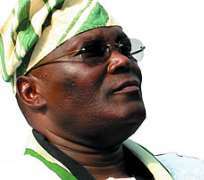 As the trial in the graft suit involving former Vice-President Atiku Abubakar and his associate and former United States (US) Representative, William Jefferson, opened... yesterday in that country, the jury heard from the government prosecutor how the lawmaker intended to deliver a $100,000 bribe to Atiku's Maryland home in July 2005. The prosecutor, however, said “bad timing” preempted the exchange and prompted Jefferson to stash most of the cash in his freezer. Assistant US Attorney, Mark Lytle, told a packed court room that the former Democratic congressman from New Orleans became involved in various illegal schemes, as he tried to deal with mounting personal debts. He said Jefferson and his wife, Andrea, owed $62,000 on credit cards at one point and had 70 overdrafts of their bank accounts with the accompanying penalties and interest payments. A 16-count indictment against Jefferson alleged that he engaged in bribery, racketeering, money laundering and other crimes by using his influence as a member of Congress to broker business deals in Africa. Lytle delivered the government's opening statement in the case yesterday. Defence attorney, Robert Trout, is expected to lay out Jefferson's defence after the court recessed for lunch. Lytle's explanation of the “cold cash” recovered by Federal Bureau of Investigation (FBI) agents in a raid of Jefferson's home showed what some had seen as a possible weakness in the case; the fact that the marked money had never been delivered to Abubakar, meaning that the former Congressman was not using it as a bribe. Lytle said the prosecution will show that the former Vice-President was in the process of leaving the US and that Jefferson was unable to deliver the payment when he first intended. The money was given to Jefferson by Virginia businesswoman, Lori Mody, who became a cooperating witness for the government after complaining to the FBI that the former Congressman was trying to defraud her. A jury of eight women and four men was seated for the trial last week. Judge T.S. Ellis III has said he expects the trial to last four to six weeks. Jefferson served nine terms in Congress, representing the New Orleans-based Second Congressional District before he was defeated last December by Republican Anh “Joseph” Cao. His defence team is expected to argue that what the government described as schemes were private business dealings between their client and others and not subject to the federal bribery statutes. Jefferson's lawyers are also expected to attack Mody's credibility and motives in helping the government with its surveillance.